Sharks (and the related rays and skates) are cartilaginous fish who’s entire skeleton is made up of cartilage, a lighter material than calcium filled bone. Historically, sharks are a very successful class of animals, and have been around since 455 million years ago. Over this long course of time the primitive fish have evolved into a highly diverse class containing 503 species of sharks, and 699 species of rays and skates, with new species recorded regularly. Instead of scales like most fish, the body of sharks is covered entirely by ridged tooth-like denticles, which reduce drag, and increase swimming efficiency. The shape of these denticles is related to swimming behavior and habitat use. Skates and rays are only partly covered by these denticles. What further distinguishes a shark is how they regulate buoyancy. Bony fish use a swim bladder, which they can inflate or deflate as needed to move themselves up and down in the water. Sharks do so using their fins and by adjusting the fat content in their exceptionally large liver. Within an ecosystem, sharks are often top predators, occupying the highest level in the marine food chain. Certain species constantly stay close to the bottom, feeding on small bottom fish and crustaceans, while some species prefer to stay on continental and insular shelves to forage on the reef, and some species migrate long distances throughout the open ocean. The spatial distribution and type of habitat a shark prefers is contingent on different environmental factors, such as salinity, water turbidity, water temperature, type of substrate, but most importantly the availability of prey and shelter, and the presence of conspecifics. 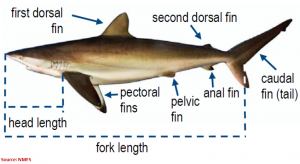 Shark reproduction can occur either by egg-laying, or through live birth. The latter is a unique feature of cartilaginous fish. In live bearing species the fertilized egg develops within the female into a full-term embryo by nourishment from a placenta, an internal yolk sac, or a combination thereof, before being birthed as a miniature shark completely able to feed itself. In egg-laying species the egg is enclosed with a thick leathery case and deposited in a safe location to develop outside of the body. The duration of a single reproductive cycle is only known for few species, but for most it takes approximately two years. Though some species reproduce every year, and some seem to reproduce only once every three years. The sense of smell, or chemoreception, is highly evolved in sharks. They can sense chemicals in the water entering through their nostrils with their olfactory organs. The most attractive chemicals are amino acids and amines (the building blocks of proteins), which can be found in high concentrations in their prey, such as crab, shrimp, or other fish. The sense of hearing is called mechanoreception, because sensing is done by detecting oscillations in the water, just as humans hear sounds through oscillations in air. This is strongly developed in sharks, as adult reef sharks can detect struggling prey from as far as 200 meter. The degree to which a shark is able to detect oscillations in the water is contingent on their lifestyle. Pelagic sharks that hunt midwater have more sensitive hearing than do sharks portraying a bottom feeding lifestyle. The size and location of the eyes are variable among different species, for example between sharks that mostly forage at night, and in the open water column, or deep sea species. Most species have monochromatic vision, which means they can only see a single color. Although at least one species of ray from the Pacific Ocean (Rhinobatos typus) likely has trichromatic vision, and seems to be able to distinguish three different colors. Cartilaginous fish perceive electric fields through their ampullae of Lorenzini, which are apparent on the dorsal and ventral surfaces of the rostrum (or nose) as a cluster of pores. The movement of muscle causes electrical signals, which allows sharks to detect prey that it buried under the sand, or hidden in a crevice or a rocky reef during nighttime. The sense also allows male rays to detect females, and it is used to detect the earth’s magnetization as guidance during long term or daily migrations. It is hypothesized that the latter may be what drove the evolution of the elongated head of hammerheads.